I've recently been introduced to a seemingly whole new world; the world of wholesale shopping places in Manila, particularly Divisoria and Binondo; thanks to my older sister who had lately made her weekends busy by retailing in a city mall and a town weekend market. I shopped for items in wholesale prices so they can resell it in the province. I've been to several malls and shops with cheap finds since years ago; i.e. Tutuban and Divisoria as well as Baclaran and even Greenhills but it was only the latter that I actually enjoyed. The rest were not to my liking back then as I wasn't really into bargain goods. But after seeing how easy it is to find products you can buy for wholesale (provided the store offers this setup and you purchase at least 6 items of the same product) and then sell for retail price. After several trips to the place, I've even found regular wholesalers to purchase items from including footwear and accessories. So if you're planning to go on shopping or very affordable products in this side of Manila for personal or business purposes, a good route to start with is in Juan Luna Street. Then walk towards 168 mall, then Tutuban center (a few meters away), and lastly at 999 mall. 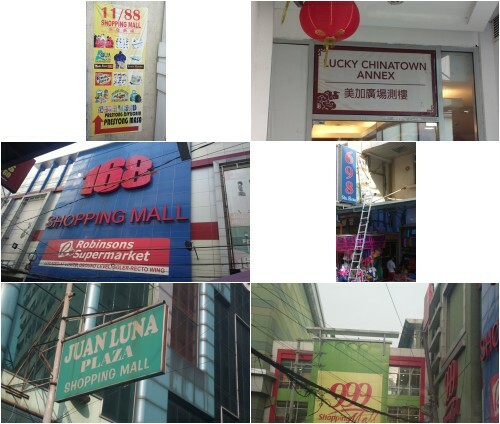 There are also several smaller malls you can visit along the area. As for parking, Lucky Chinatown mall is the safest place for your vehicle. However, the parking fee is quite expensive. For directions, here's a very helpful post How to Get to Divisoria.